Raeesa Mohamed (second from the left) with fellow volunteer team members from World Partnership Golf, Edmonton. “I was lucky enough to be born in this developed country, with everything I could ever need at my fingertips. It is devastating to think that this was not the case for my parents and is still not the case for millions of people on this planet.” Raeesa Mohamed, World Partnership Golf (WPG) Volunteer, Edmonton, AB. Raeesa had the values of giving back instilled in her from an early age. Her parents’ experiences of living in East Africa, coming to Canada to start a new life, and their belief in supporting others less fortunate than themselves have fueled her desire to volunteer and help others throughout her life. As a WPG volunteer, Raeesa has gained many news skills, ranging from developing a “knack for avoiding golf balls” — essential of course when working on a golf course — to gaining key communication, leadership and project management skills. However, what she has personally found most rewarding has been the opportunity to work and learn from such a professional and inspirational group of people. Raeesa has also become a true advocate for Aga Khan Foundation Canada (AKFC) and its development programs that the tournaments support. Raeesa explains, “changing the world may seem like an impossible feat at times, but this event is truly impacting lives. The funds raised go towards sustainable, long-lasting solutions that…ignite the spark of change.” With over $14 million raised nationally since 2000, WPG has really been able to make a difference. 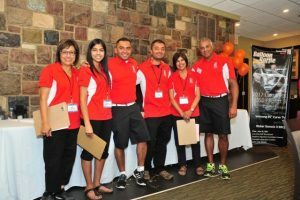 Over the years, Raeesa has had many proud moments as a WPG volunteer, but her most memorable moment to date was volunteering alongside a sponsor this year, who was experiencing the tournament for her first time. There’s still time to get involved and take a swing at global poverty.